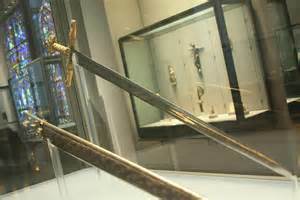 Joyeuse - The sword of Charlemagne; one of the most famous swords in history. It is the object of several legends. One being that part of the spear used to pierce Christ's side (known as the Lance of Longinus) is forged into its hilt. Another is that the emperor used Joyeuse to behead a Saracen commander named Corsuble after defeating him in battle. Charlemagne routinely brandished it while leading his army, particularly during the Saxon Wars where so many opponents were killed, either in battle or by execution. In succeeding generations, it became a symbol of French monarchs, used during coronation ceremonies (although it is not certain that the sword which sits in the Louvre is the genuine article). The famous portrait of Louis XIV by Hyacinthe Rigaud shows the king posing with it.